Photo: Spring 2018 Research Fellows–Daisuke Katsumata, IDP, Chelsea Armistead ’18, Adelaide Jenkins ’18, Jillian Ramsay ’18, Professor Carol Clark, Larisa Bogomolov ’20, and Michelle Treglia ’18–stand smiling at the end of their successful poster presentations! On Monday, April 30, 2018, Trinity’s Community Learning Research Fellows program finished out its seventh year with spring presentations from four fellows who completed year-long projects as well as a team of econometrics students who were continuing a fall 2017 research fellows project. 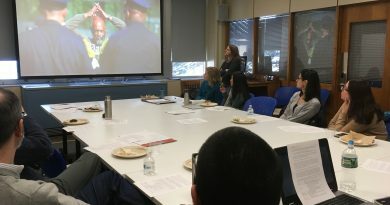 Led by Professor Carol Clark, associate professor of economics, the Research Fellows program sponsors a weekly colloquium for students and faculty to develop community-based research projects in consultation with Hartford partner organizations. 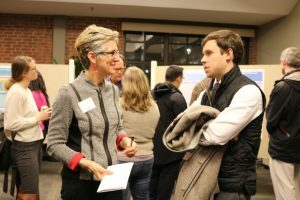 At this year’s well-attended event, Trinity students and Hartford community partners celebrated a year of work that engaged students in community-based research and helped our partners reach their goals. 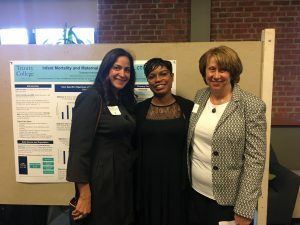 “Maternal Health and Infant Mortality in Hartford, CT” project with Hartford’s Department of Health and Human Services, Maternal and Infant Outreach Program. From Left to Right – Elby Gonzalez-Schwapp, Chelsea Armistead ’18, and Professor Dina Anselmi. Several of this year’s Research Fellows took on year-long projects to work with community partners across Hartford. Chelsea Armistead ’18 presented her analysis of vital records of live births and infant mortalities from 2010 to 2015 to chart the progress of the city of Hartford’s Maternal and Child Health Division’s strategic plan for reducing infant death (with Professor Dina Anselmi, in partnership with the city of Hartford’s Department of Health and Human Services, Maternal and Infant Outreach Program). Several, but not all, goals have been met, and Armistead recommends analyzing data more quickly to encourage better-tailored objectives that can be reached in a timely manner. 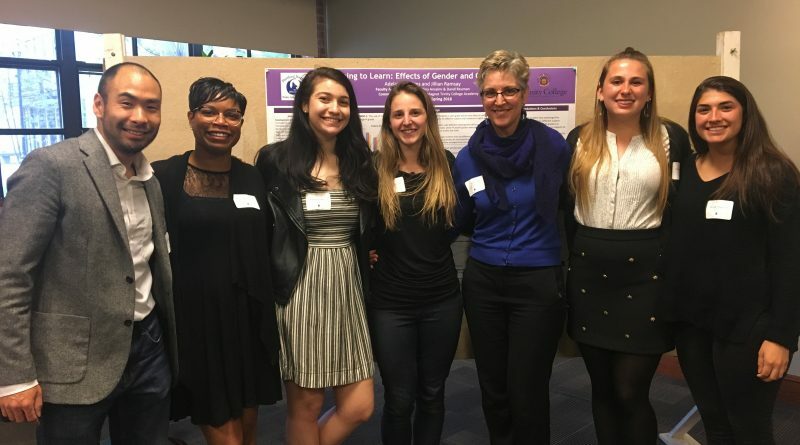 Adelaide Jenkins ‘18 and Jillian Ramsay ‘18 (with Professors Dina Anselmi and David Reuman, in partnership with Timothy Roarty and Andrea Heller of Hartford Magnet Trinity College Academy) studied gender- and age-differences in metacognition of middle school students across two subjects: Social Studies and Mathematics. Their study addresses gaps in the research related to these topics, and their result show significant developmental and gender effects on metacognition that require further research. 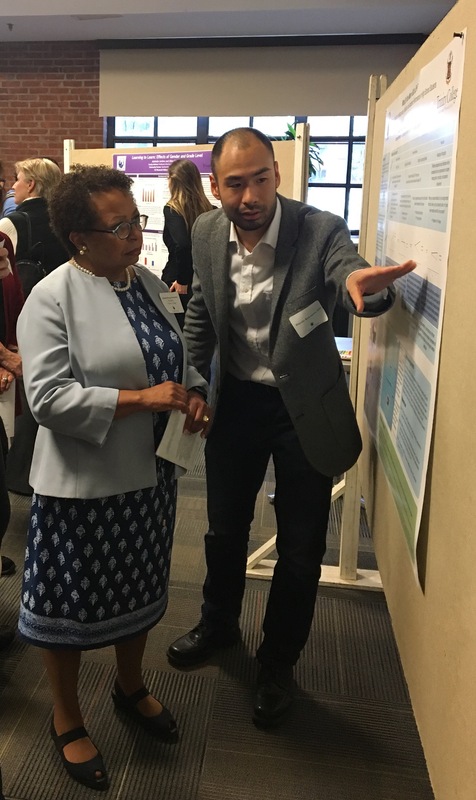 Daisuke Katsumata, IDP, explains his project on feedback and metacognition for high schoolers to President Joanne Berger-Sweeney. Daisuke Katsumata, IDP, investigated whether students’ academic achievement, motivation, and metacognition change based on the type of feedback provided on assignments–either graded with minimal written feedback or ungraded with more extensive written feedback (with Professors Dina Anselmi and David Reuman, in partnership with Deb Avery of Hartford Magnet Trinity College Academy). Katsumata found that students were able to learn more effectively by the end of the unit when given no grades alongside enhanced feedback, but students had a hard time perceiving their own growth during the four-week period of study. Other students continued work from the fall. Larisa Bogomolov ‘20 (with Professor Carol Clark, in partnership with the Southwest/Behind the Rocks Neighborhood Revitalization Zone) examined how the NRZ can use the qualitative data she gathered from local business leaders in the fall to support including these businesses in revitalization efforts. Toward that end, Bogomolov designed and implemented an NRZ-local business conference to build relationships while also analyzing scholarship on community-based action to offer suggestions for how the NRZ might strengthen its organizational capacities. A new group of econometrics students, Nick Branchina ‘19, Jack Clark ‘19, Nhat Pham ‘18, and Kyle Scheffers ‘18 (with Professor Diane Zannoni, in partnership with the Hartford Community Loan Fund), extended previous analyses of financial institution mortgages in metropolitan Hartford completed by Research Fellow Ken Haas, IDP, to see if the probability of an individual’s home mortgage loan being approved depends upon neighborhood, controlling for other factors that may influence the lender’s decision. Using logistic regression analysis, they found that at the individual level, neighborhood does not matter and that there are more approvals in “better” neighborhoods because there are more applications in those areas. This year’s Research Fellows presentations also served as a capstone for the excellent work Professor Carol Clark has done for the Community Learning Initiative over the last eight years. She served as CLI Director from 2010-2017 and cultivated a strong spirit for community learning across campus by helping many faculty every year develop new community-based components for their courses. She innovated several aspects of the program, spearheading a biannual regional workshop on a community-based teaching topic of interest, and proposing and finding funding for the Community Action Gateway, a first-year program focused on connecting classroom learning and local action. Professor Carol Clark and David Lavery, Connecticut Fair Housing, chat at the Dec. 2017 Research Fellows presentations. Even as Professor Clark stepped out of her position as CLI Director, she continued innovating by redesigning the Research Fellows program this year to enrich the community-based research process for students. In addition to scheduling new Friday lunchtime class meetings, she also created the role of a Community Consultant (held by James Jeter of Hartford Community Loan Fund this year) to participate in discussions each week. Professor Clark’s years of service to CLI have had an incalculable reach–allowing students to engage their academic learning with real-world issues and partnering with local organizations to reach their goals and address their needs–ultimately strengthening the work that Trinity has been able to do in Hartford. For all of this work, we thank her!